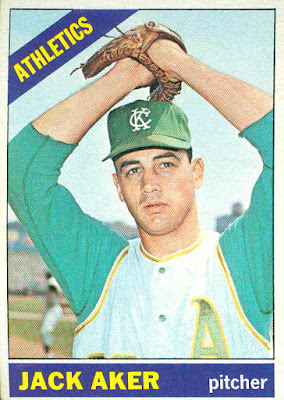 Nicknamed “The Chief” due to his American Indian heritage, Jack Aker was signed by the Kansas City Athletics as an outfielder in 1959, and after 1 season was converted to a pitcher. He made his major-league debut in 1964, but played part of that season and the next in the minors before returning permanently to the bigs in July 1965. Jack pitched for 11 seasons, and pitched every one of his 495 games in relief. In 1966 he led the AL with 32 saves, and in games finished with 57. 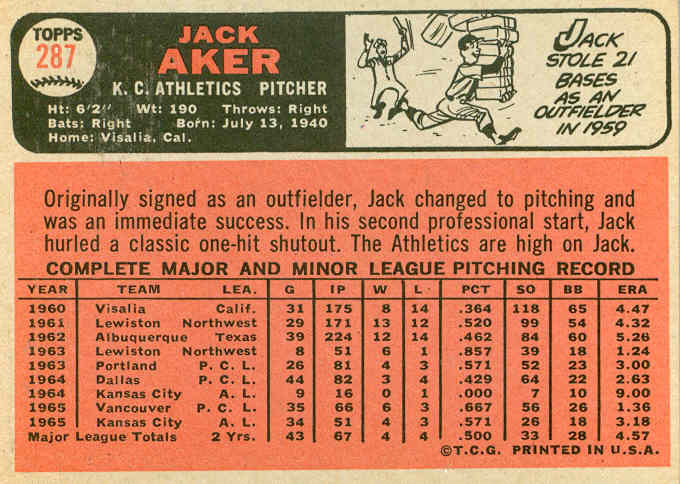 Aker was the Top Dog in the A’s bullpen for 3 seasons (1966-68), then at age 27, was inexplicably left unprotected in the expansion draft, and was selected by the Seattle Pilots. Aker teamed up with the veteran Lindy McDaniel and others in the Yankees’ bullpen for the next 3 seasons. In May 1972, he was traded to the Cubs for outfielder Johnny Callison. After 1 ½ seasons with the Cubs, Aker split his final season (1974) between the Braves and the Mets. He managed in the minor leagues after his retirement, and was the Indians' pitching coach in the mid-1980s. For 20 years beginning in 1988 he ran a youth baseball camp. 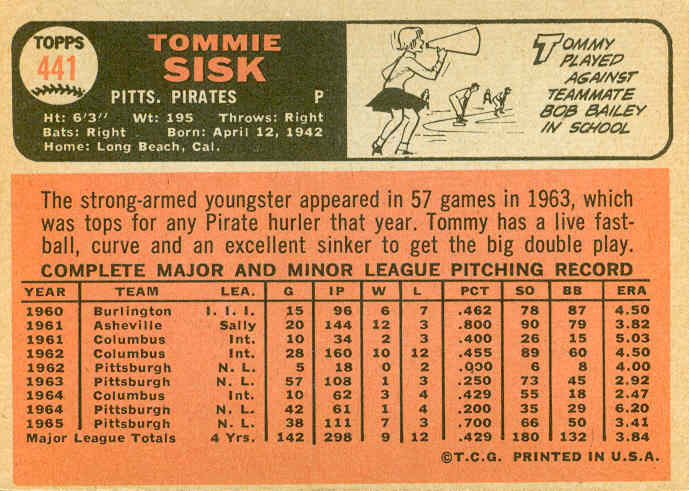 Tommie Sisk played for 9 years (1962-70), mostly as a starting pitcher for the Pirates. Sisk was signed by the Pirates in 1960, and was a starting pitcher in their farm system for 3 seasons. 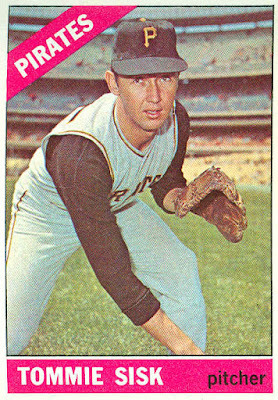 He also played a few games with the Pirates in late July, and again in late-September 1962. In 1963 and 1964, Tommie worked out of the Bucs’ bullpen, along with Al McBean and the veteran Elroy Face. 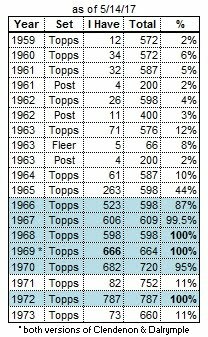 Sisk appeared in 57 and 42 games over that span. He began the 1965 season in the bullpen, but by late-July Sisk was moved to the starting rotation, replacing Joe Gibbon. 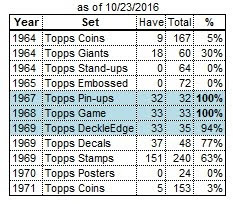 His final 12 games that season were all starts. 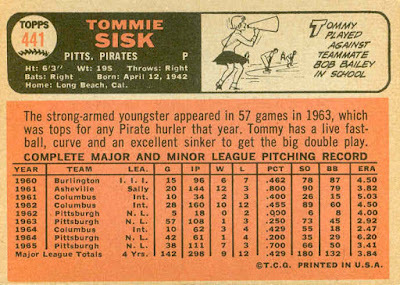 Tommie was primarily a starting pitcher for his final 3 seasons in Pittsburgh. By this time, veterans Bob Friend and Vern Law were winding down, and Bob Veale had taken over as the staff ace. Veale, Sisk, Steve Blass, and rookie Woodie Fryman formed the core of the rotation. Sisk won 10 games in ’66 and 13 in ’67 (with 11 complete games), but an off-year in 1968 probably made him expendable, and the following March he was traded to the expansion San Diego Padres. After 1 season in the Padres’ bullpen, Sisk was traded to the White Sox. 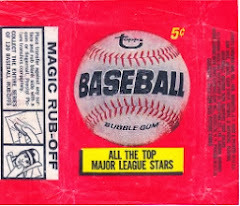 He played in 17 games with the ChiSox through mid-June, then was traded to the Indians for pitchers Bob Miller and Barry Moore. Tommie’s last major-league action was with the Sox, as the Indians assigned him to their triple-A team for the rest of the season. Sisk pitched for the Expos’ AAA team in 1971 before retiring.